This unique collection synthesizes insights and evidence from innovators in consumer informatics and highlights the technical, behavioral, social, and policy issues driving digital health today and in the foreseeable future. Consumer Informatics and Digital Health presents the fundamentals of mobile health, reviews the evidence for consumer technology as a driver of health behavior change, and examines user experience and real-world technology design challenges and successes. Additionally, it identifies key considerations for successfully engaging consumers in their own care, considers the ethics of using personal health information in research, and outlines implications for health system redesign. The editors? integrative systems approach heralds a future of technological advances tempered by best practices drawn from today?s critical policy goals of patient engagement, community health promotion, and health equity. Here?s the inside view of consumer health informatics and key digital fields that students and professionals will find inspiring, informative, and thought-provoking. 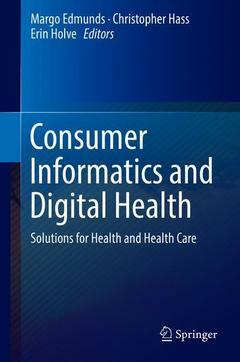 The opening chapter will define consumer informatics, describe the history of different branches of the field (e.g., virtual visits/telehealth, mobile health, and the e-patient movement), and provide a framework for evaluating and disseminating evidence about ways to improve the consumer experience and change health behaviors. This chapter will review the state of the art and new directions for online tools to engage consumers in health and health care, focusing on social media platforms, consumer-facing web portals, and emerging technologies from the quantified self movement. This chapter will review the development, state of the art, and new directions for mobile devices in global health. This chapter will describe innovations in the use of online and mobile technologies to promote community health and health equity with diverse populations. This chapter will lay out the fundamentals of user experience (UX) and user-centered design for the Web, including accessibility for people with disabilities. Case examples will be provided. Building on Chapter 5, this chapter will provide practical guidance on applying the principles of user-centered design to ensure the quality of consumer-facing products and services. n be used to increase consumer engagement with content. Persuasive technology uses behavioral science to design systems that promote consumer behavior change similar to personal health coaching, and taking into account both health and technology literacy. This chapter will provide practical advice on using these approaches in the development of health content for consumers. pter will separate out the reality and hype and provide a technical reference for the chapters in Section IV on privacy and security. With the explosion of consumer-relevant and consumer-generated health data, this chapter will describe ways to help consumers make the best use of information from a wide variety of sources. es widely across different sites. This chapter will review evidence on the value of web information in consumer-driven health care and describe best practices for developing consumer-friendly web content. This chapter will describe innovative methods to provide consumer-friendly content through visual means. It will be based on the author's work with electronic health records and self-reported information from residents of low-income communities in Northern Manhattan, New York City. health, it is important for personal health information and consumer-generated data to be standardized, structured, and aggregated for health planning purposes by local health agencies. This chapter will address some of the important technical and governance issues involved in integrating individual health data into health information exchanges at the local and regional levels. This chapter will provide examples of emerging best practices in culturally competent consumer engagement in a variety of clinical and community settings. adults and their caregivers are becoming increasingly important with the growing number of people managing chronic health conditions through self-care and home-based care. This chapter will review the key technologies, challenges, and opportunities for remotely generated patient data to improve the health of older adults. Including consumers in the free flow of health information is a policy priority, but it will require significant changes in culture and infrastructure. This chapter will provide a consumer-friendly primer on how federal requirements for meaningful use of health data are evolving to improve consumer access to personal health information. The Privacy Rule that governs health information transactions has not kept pace with consumer technology and the Web, and many providers believe HIPAA restricts data sharing with consumers and patients. This chapter provides a legal perspective on how HIPAA should be rewritten to allow the free flow of health information to consumers. cerned about data breaches. This chapter provides some innovative perspectives on privacy technology that enables trust. This chapter will address ethical issues in consumer informatics and online content, including quality assurance, privacy, and security concerns; consent and governance; and the important role consumer information plays in shared decision-making. If privacy concerns have slowed the progress of research, new approaches, such as a pool of freely available health and genomic data, could accelerate innovation. This chapter will describe the range of ethical perspectives on data sharing and propose a new approach. Health care systems have lagged behind other industry sectors in developing secure information-sharing strategies. This chapter will describe the information technology infrastructure and implications for consumers to protect their personal information. This final chapter will summarize technology, social, regulatory, and other trends and issues raised in the book, including the role of collaboration and citizen science for health delivery system reform and population health.